Disclaimer: I received a product sample and compensation for this post. The opinions and text are all mine. 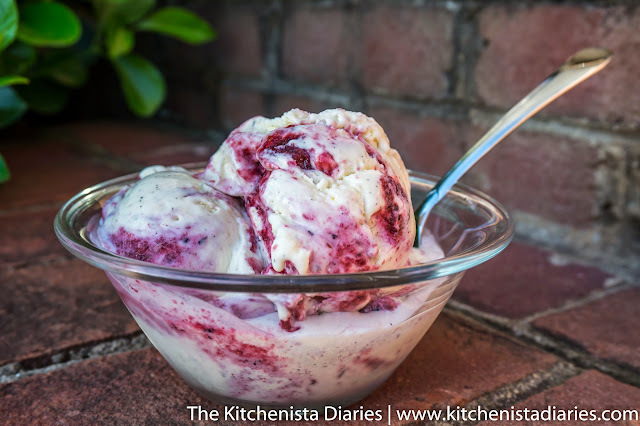 This is my first ice cream recipe for the blog! Last Christmas, my sister gave me an ice cream maker attachment for my mixer bowl. She's impressed me with some of her creations and it was past time that I got busy making my own. Ice cream is my best friend. I love it, such a guilty pleasure. Any frozen creamy dessert concoction really - ice cream, frozen yogurt, gelato, sherbet, sorbet. Yes, please. Those who know me on social media are well aware of my addiction to a certain line of gelato products. It's a problem. But it was time for me to put my talents to use and try my hand at making my own. 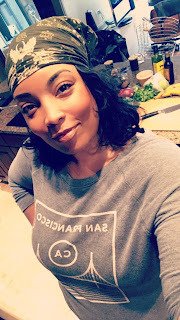 I'm about as excited as a little kid going to the ice cream shop when I think about all the infinitely creative flavors I can make at home. 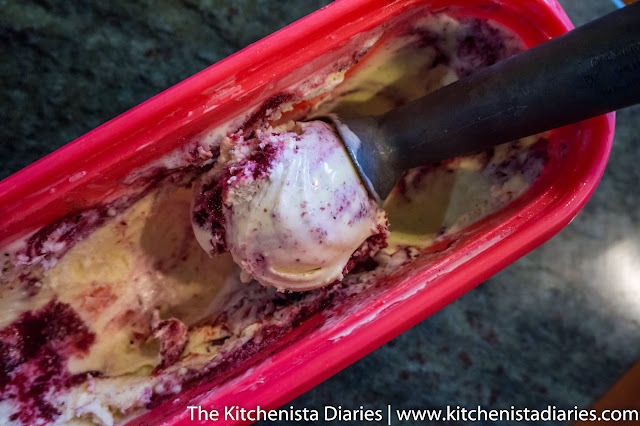 One of my old Hatchery subscription boxes was the inspiration behind this particular ice cream recipe. The little jar of Meso Nutso Lavender Extract was so fun to play with that I went ahead and got the full size. Lavender is more of a floral scent to me than a flavor, but it makes an impact. In sweet applications, lavender works really well with cream, berries, honey and vanilla flavors. I haven't worked much with lavender buds other than an infused lemonade I made once and it took a bit of soaking and straining. 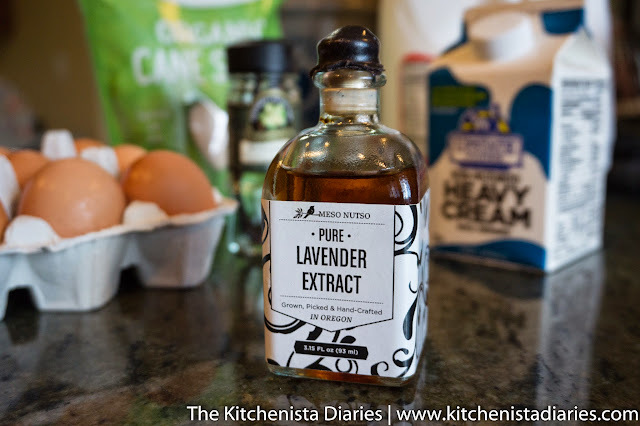 The lavender extract was perfect and so much easier to use for baking. My first successful experiment was a strawberry cardamom cake with a white chocolate lavender glaze and strawberry sugar. The flavors were really interesting and worked well together. Baking still isn't my favorite thing though, and I wasn't about to keep making cakes to get this one perfect. I knew I could do something a little more lavender forward so I went back to the drawing board. 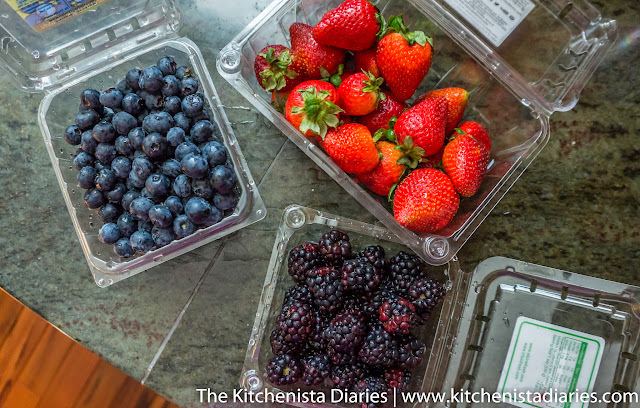 With late spring comes an influx of berries at the markets and lavender peaks in the summer. I decided to keep things seasonally appropriate. A craving for fresh strawberry ice cream had been dancing in my head for awhile, but as usual I can't seem to settle on a plain version of anything and ended up turning it up several notches! I did decide on keeping the base of the ice cream vanilla as I'm a novice at making it, but it was easy to incorporate the lavender extract into that part of the recipe. Fresh berries would be the perfect compliment. All the berries looked so good when I went shopping and I couldn't help but grab them all. Strawberries. Blueberries. Blackberries. Why not? 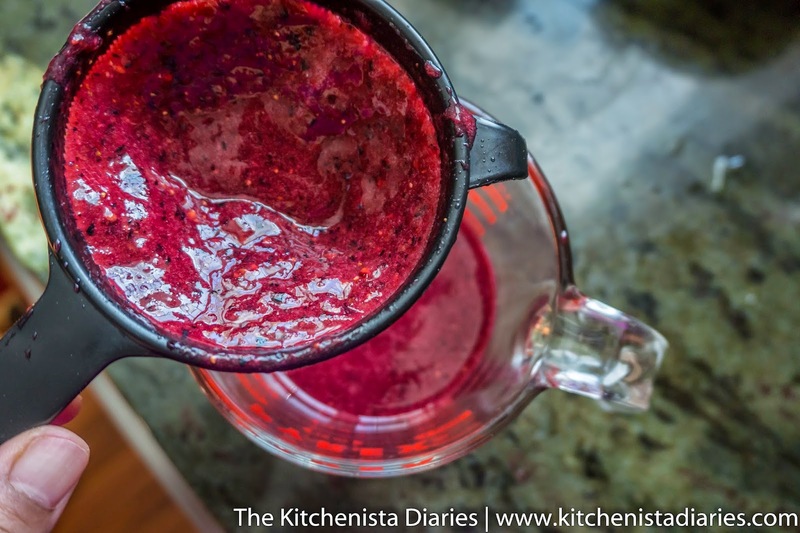 My original plan was to cook the berries down into a compote of sorts, but in a moment of laziness meets ingenuity I pureed and strained them to make a fresh berry coulis. That's just a fancy word for a thick, strained sauce made of veggies or fruit. At any rate, these berries were great quality and I didn't see the need to mess with them too much! 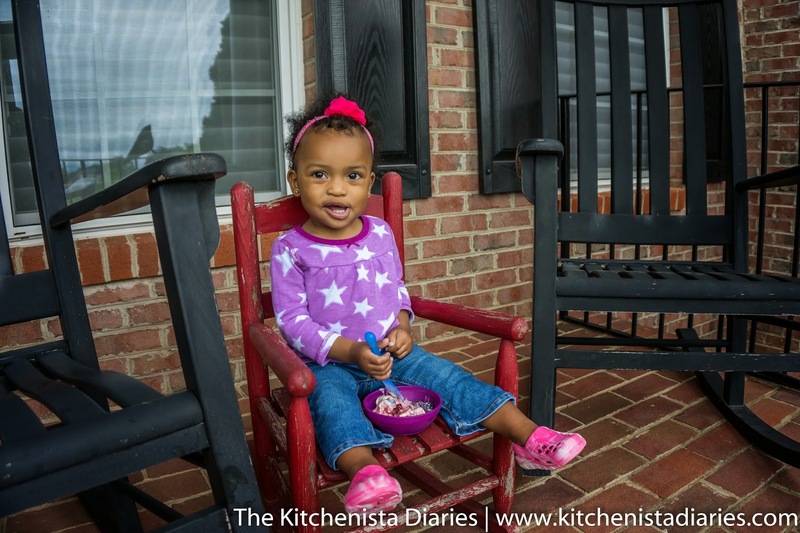 When I'm telling you my daughter eats strawberries like she needs them to survive, I'm not kidding. I have to steer her away from that section of the store or she sees them and throws a fit. You know that first basket of the season that actually tastes like strawberries? This was it. 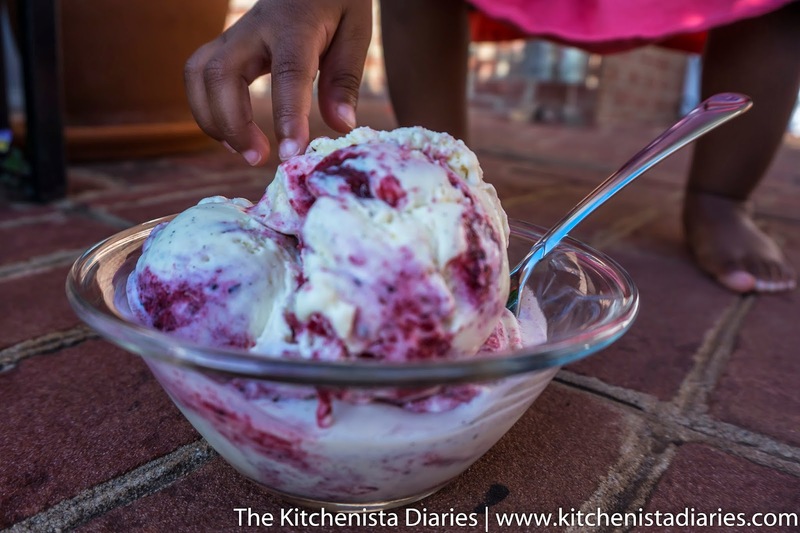 Not that it takes berries to get a child to eat ice cream, but trust me it sealed the deal. I let her have a few bites of ice cream before hiding the rest in the freezer for myself, because I'm selfish and a real mom. Judge away. Ice cream is one of those things many people won't feel the need to make themselves. But if you have the equipment or have been looking for a reason to buy it, I've gotta say it's worth doing. 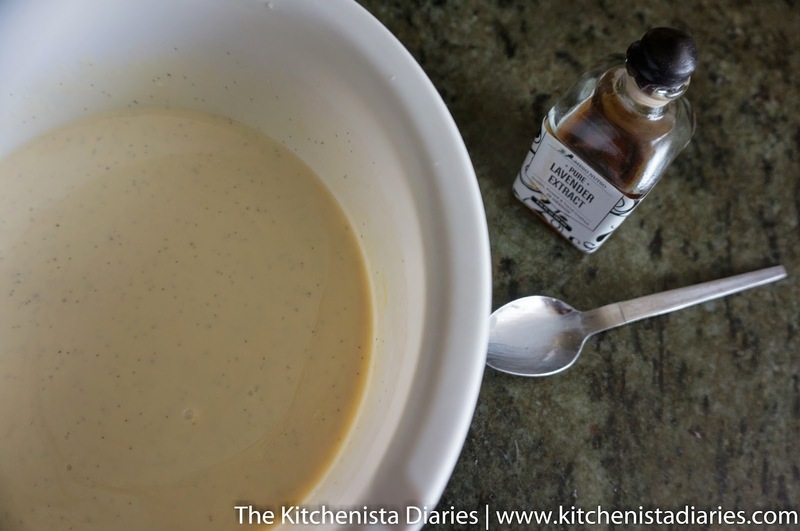 The vanilla bean custard base I used for my recipe was adapted from The New York Times' Master Ice Cream Recipe. I found it to be really easy to follow and modify. 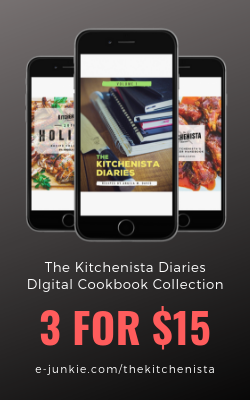 This is one of those recipes that improves with the best quality ingredients you're able to use. Besides knowing exactly what goes into my ice cream, it's been a lot of fun to come up with flavors I like on my own. 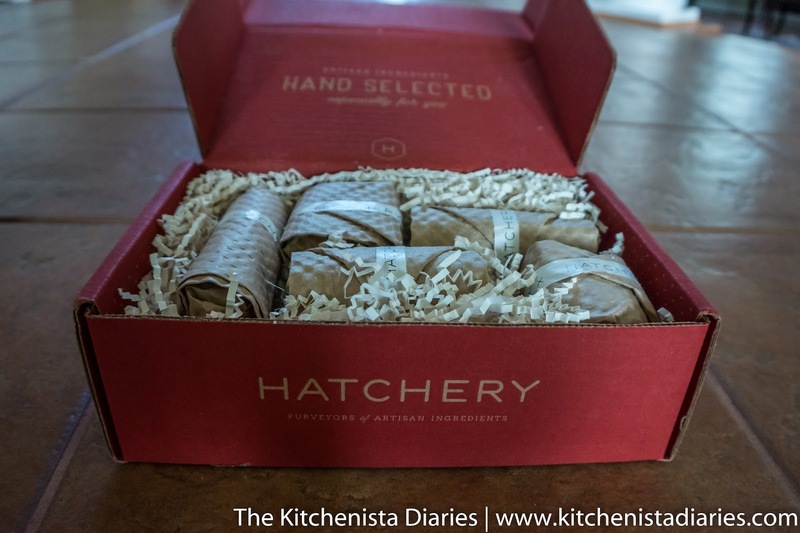 Who knows, maybe the next Hatchery box will inspire your next flavor! Vanilla ice cream base recipe adapted from The New York Times. Plan to do this over 2 days to make your life easier. Things work better when the custard base and coulis are both thoroughly chilled before churning, so do that on the first day. The instructions below were based on using a Kitchen Aid mixer, so modify per the equipment you have on hand. I keep my ice cream bowl attachment in the freezer when not in use so that it is always chilled and ready when I need it. The first step is to prepare the vanilla bean custard base for the ice cream. You'll need to gather everything but the lavender at this point. In your pot, combine the heavy cream, milk, sugar and salt. Simmering over low heat, stir until everything dissolves. After a few minutes, remove the pot from heat. In a separate bowl, whisk the egg yolks. Most available tool to separate eggs? Your hands. You can save the egg whites for another recipe, but freeze them if you don't plan to use within a day. The next step is called tempering. 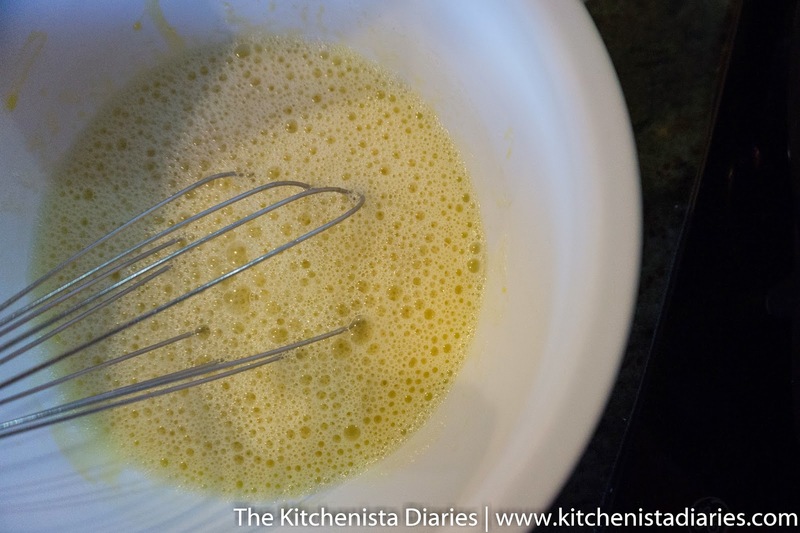 Add about a cup of the warm cream mixture to the egg yolks and quickly whisk until blended. 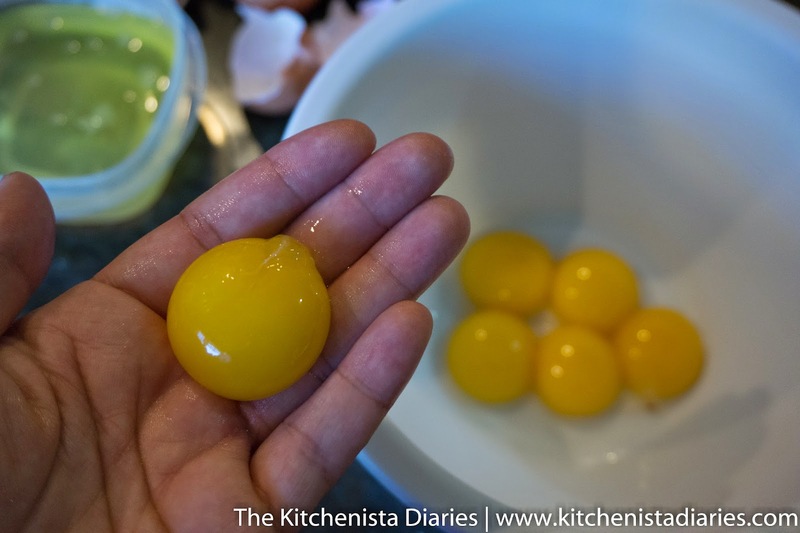 This warms the egg yolks a bit, so when you add them to the pot in the next step they don't immediately cook. Nobody wants scrambled egg ice cream. 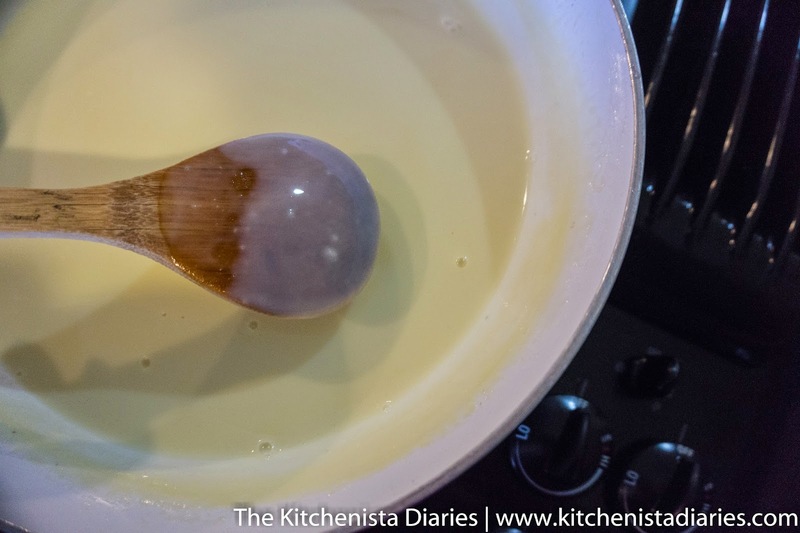 Pour all of the tempered egg yolk mixture into the pot of cream and return it to the stove over medium low heat. Stirring constantly, gently cook until the mixture is thick enough to coat the back of a wooden spoon. That took about ten minutes for me. It should warm to 170° F on an instant read thermometer; mine read a little higher before it was thick enough. As soon as you get there, remove the pot from the heat. 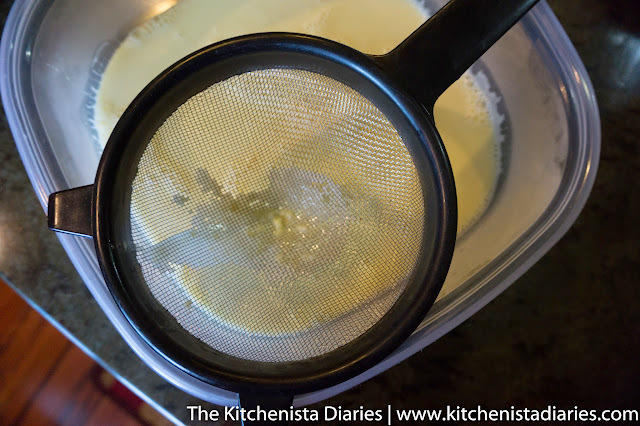 Strain the custard base through a fine mesh sieve. This will help remove any tiny lumps you weren't able to get out while stirring. 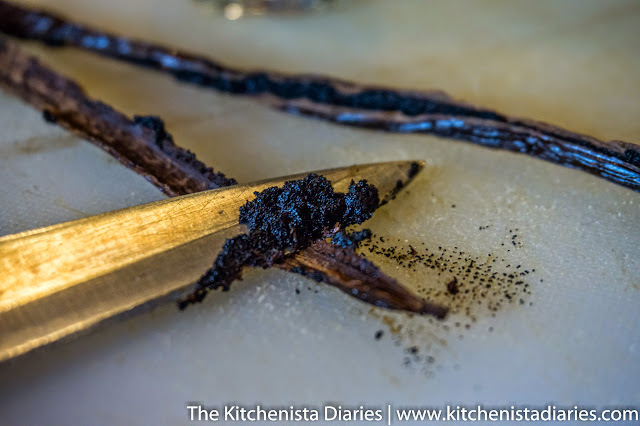 Slice the vanilla bean in half lengthwise and use your knife to scrape out the insides. That black paste is pure vanilla flavor! 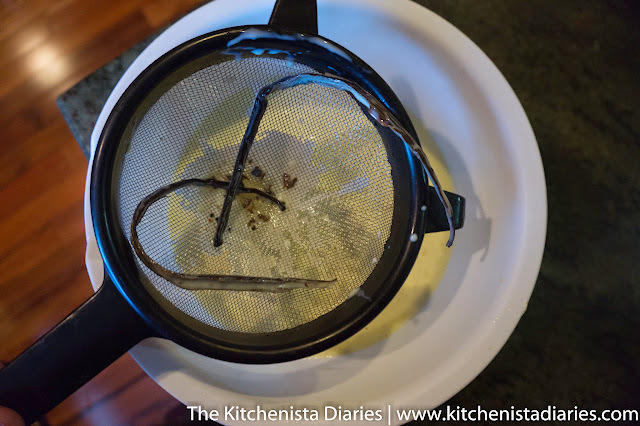 Add the vanilla bean paste and the scraped pods to the strained custard base. Let that steep for thirty minutes while cooling to room temperature. One more time, strain the custard base into a bowl to discard the vanilla pods and any debris. Cover and transfer the strained vanilla bean custard to the fridge and allow to cool at least four hours, but preferably overnight. To prepare the berry coulis, add all of the berries to your blender along with the lemon zest and sugar. Puree until the mixture is smooth, then strain to remove seeds. Press the puree with the back of a spoon to help push it through the strainer. Stir in the honey. 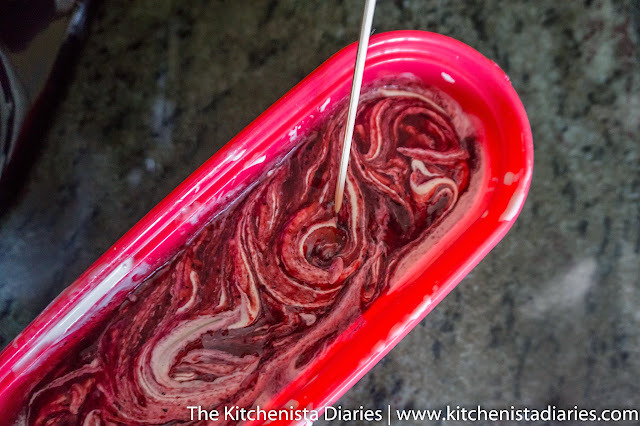 I did this last because there was no reason to make the coulis any thicker before straining. 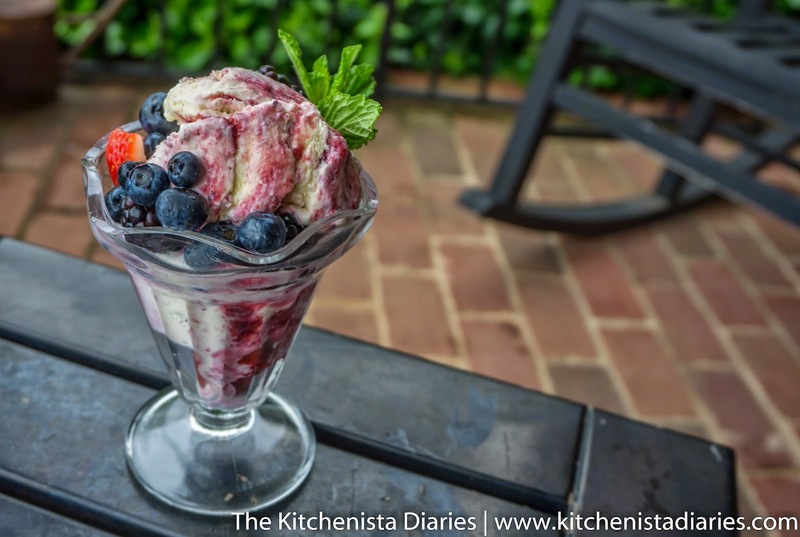 The honey was more noticeable than blending it into the berries, so you get a real taste of it with each bite of ice cream. 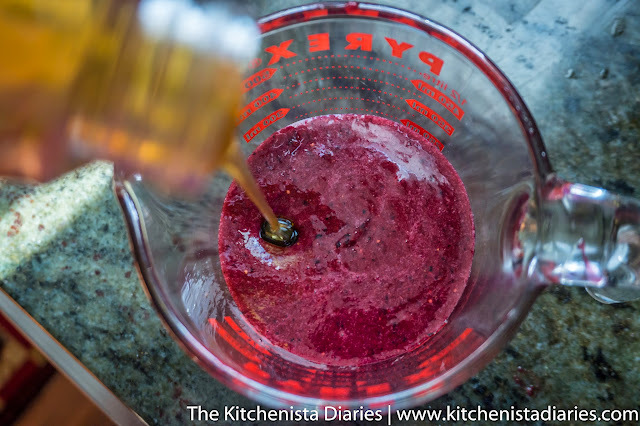 Once the berry coulis is mixed (and sweetened to your liking) transfer it to the fridge to chill thoroughly. I let everything chill overnight and did the churning next day. 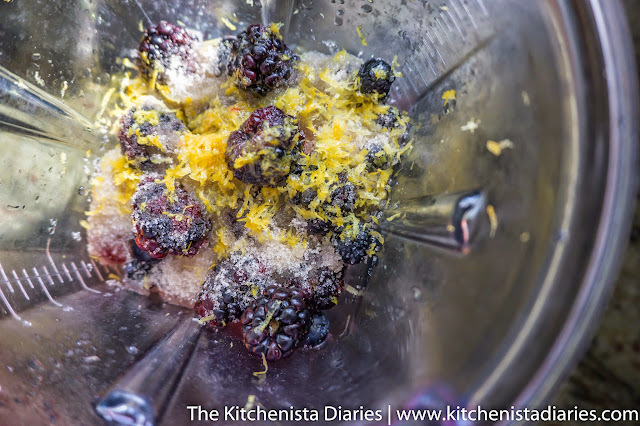 Before churning, add the lavender to your custard base. I found that the lavender was less muted adding it to the chilled base just before churning. About three teaspoons was enough for me to taste it without being overpowering. 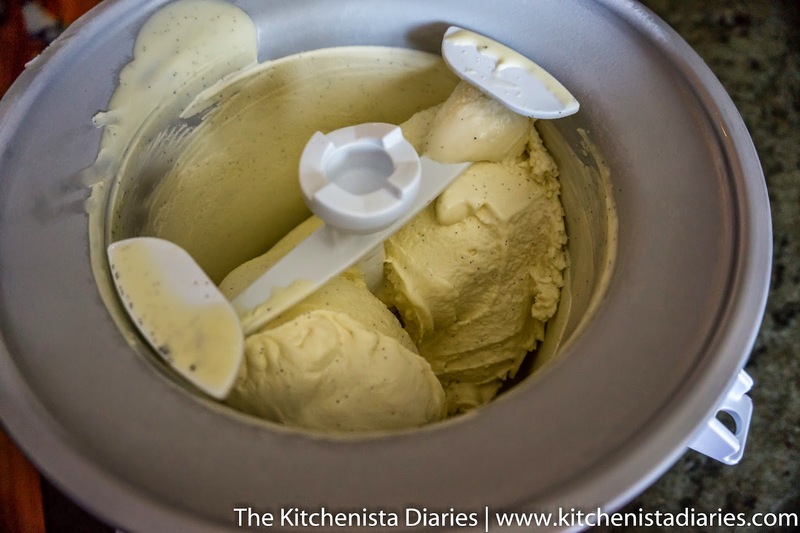 Set up your ice cream maker and churn per the manufacturer's instructions. For the Kitchen Aid, you set the speed to "stir" before pouring in the custard. 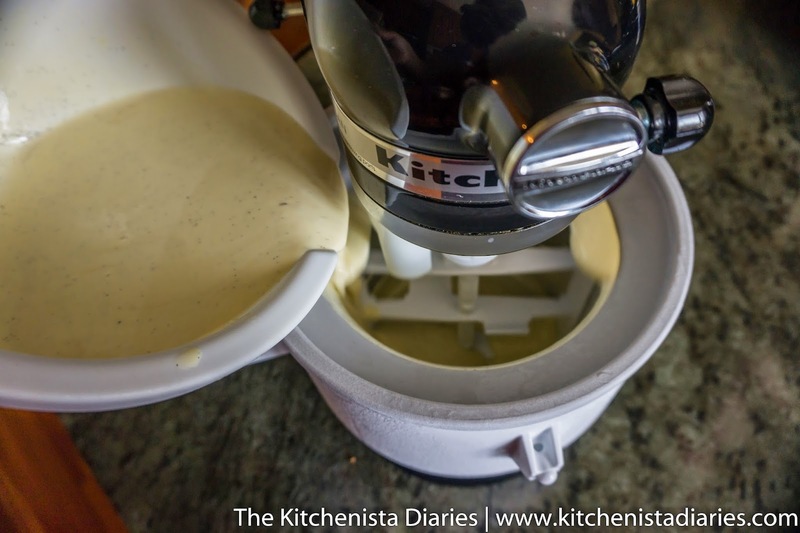 I let it churn for about 20 minutes until it had thickened enough and grew in volume. It's really amazing to watch ice cream appear before your eyes right on your own kitchen counter. At this point you could eat it, but it would be soft serve ice cream. We want to freeze it so it is scoopable. Here's how you swirl the berries into the ice cream without turning the whole mixture purple. Spoon some of the berry coulis into your ice cream container. Layer about 1/3 of the vanilla bean ice cream over that, and then spoon more berry coulis over it. My sister got me this really cool one along with the attachment, I love the shape because it's perfect for scooping and fits easily into my freezer! 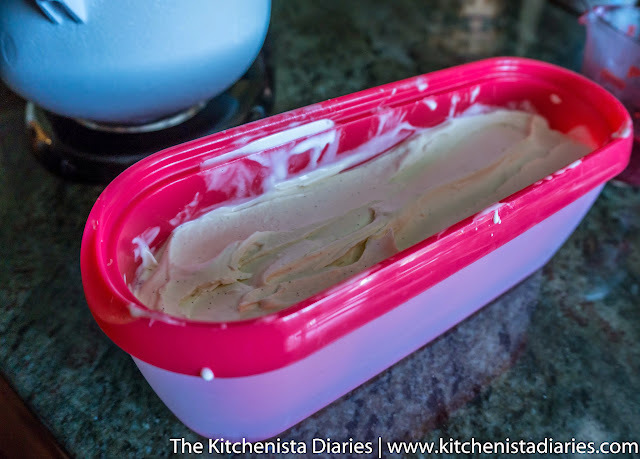 Continue layering until you reach the top of your container with the last layer of ice cream. 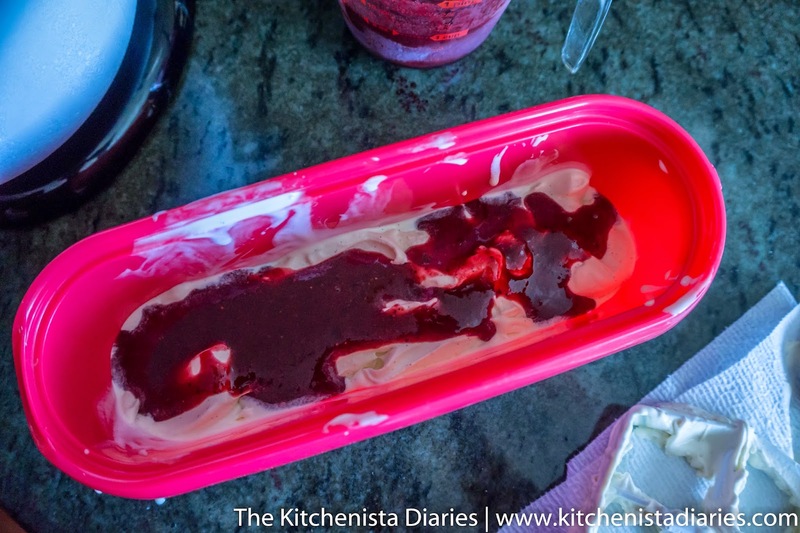 I had about 1/4 cup of berry coulis leftover that I felt would have been too much to add for it all to freeze properly. Use your best judgement. 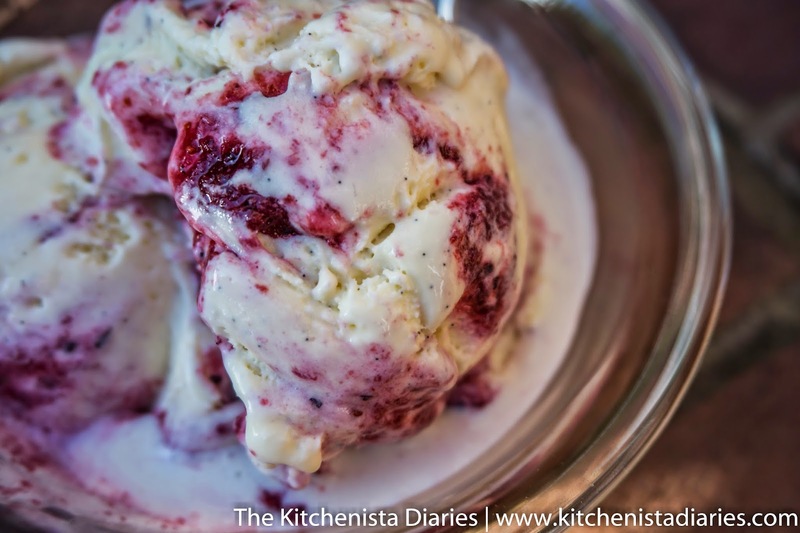 Use a thin knife or wooden stick to gently swirl the berry coulis into the ice cream. Have fun making it pretty. 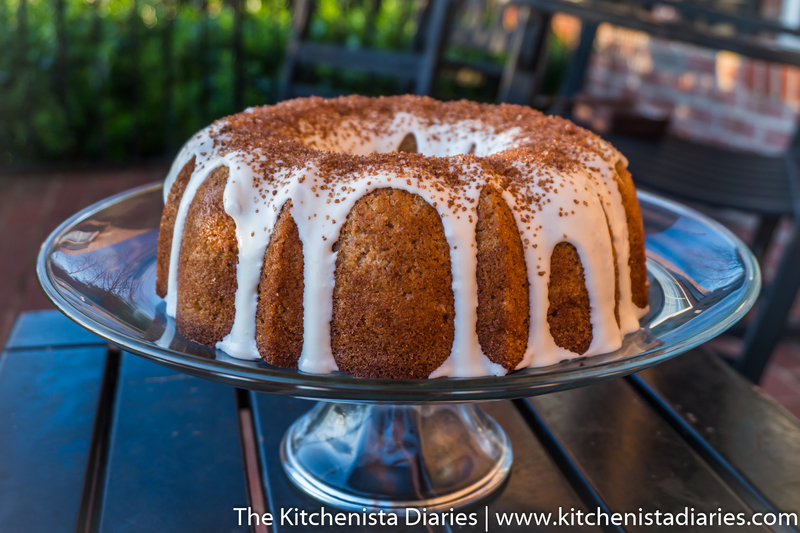 It won't stay as pretty when you scoop it, but you will get streaks of berries throughout! Cover the container and freeze for several hours until it has hardened enough to scoop. I churned my ice cream in the morning and waited until early afternoon to scoop it. It was really, really hard to wait! The pure vanilla bean flavor enhanced by floral lavender was divine, and the fresh berry swirl with a touch of honey just took things over the top for me. This was spring and summer in a bowl!